Another BIG WIND day today in Green Valley. We decided to pass on riding with our regular Tuesday gang to Tubac, although we knew the trip back to GV would be express, due to the 40mph gusts that we predicted. Instead, we hauled out our dirt bikes, and decided that we would have a fake practice run for the Barry Roubaix. (private joke. entered/conquered last year). 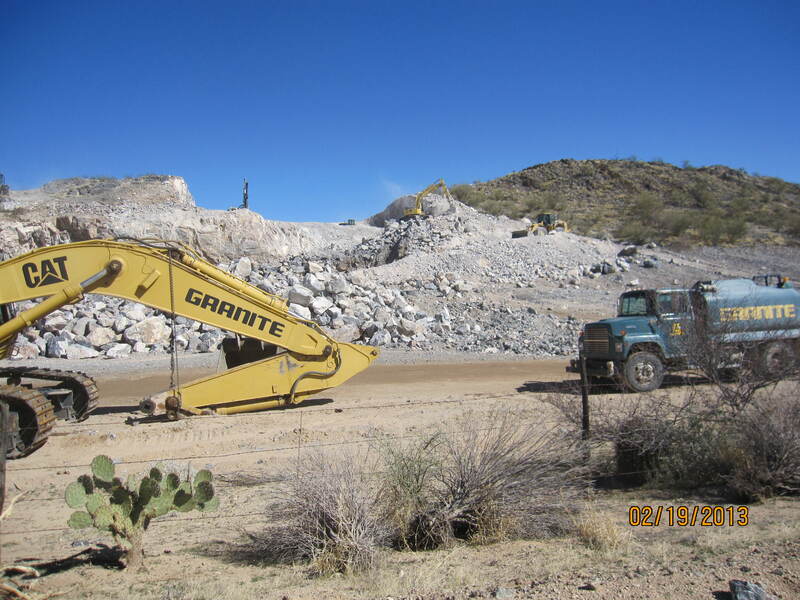 granite mining appears to be just busting boulders out of the hill. Lots of interesting sights on Twin Buttes Road. For those of you planning to install granite countertops, we saw your stone in the rough as it was excavated. 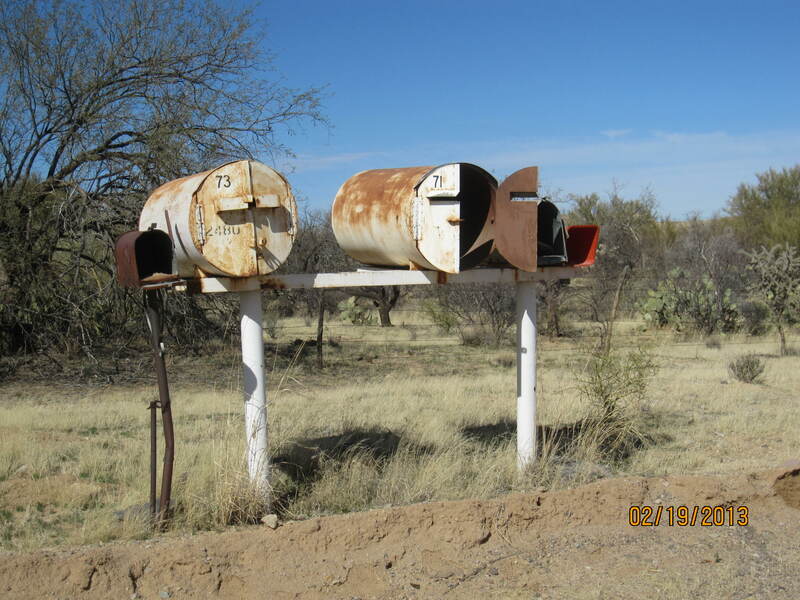 interesting mailboxes out in the middle of nowhere. We were amused when we got to the top of the hill and encountered a Border Patrol truck. The Agent asked US for directions! John helped him out. Curious encounter. Onward, we’re heading down the hill on Mission Road. It’s a long, sweeping hill, but the headwinds are ferocious. We’re heading on a five-mile glide, and having to pedal our butts off to stay upright. The wind is coming from about 1 o’clock, so we’re in danger of getting pushed across the center line in a big gust. I think the wind is every bit of 25mph steady, with huge gusts whipping us around. Makes for interesting riding. the haze ahead at ground level is actually dust from the mines, pushed by the wind. The mine dust is rolling off the end of the mine. This causes huge issues for the folks here – asthma is very common. We finally hit the portion of our ride where we were rolling downhill with a tailwind. Yahoo!!! Pedaling as hard as we could, we flew toward home. A great day for us on our bikes – different, good stuff to see, and fun (we’re all about the fun factor). Is this Arizona, or is this Michigan? (we just both got new phones – had no idea what was happening when we got these messages.). Trouble ahead, methinks…..Jezzy is seeking cover – she’s terrified with the howling wind. But, maybe this warning is for our friends in Grand Rapids? In any case, we’re battened down for the night. 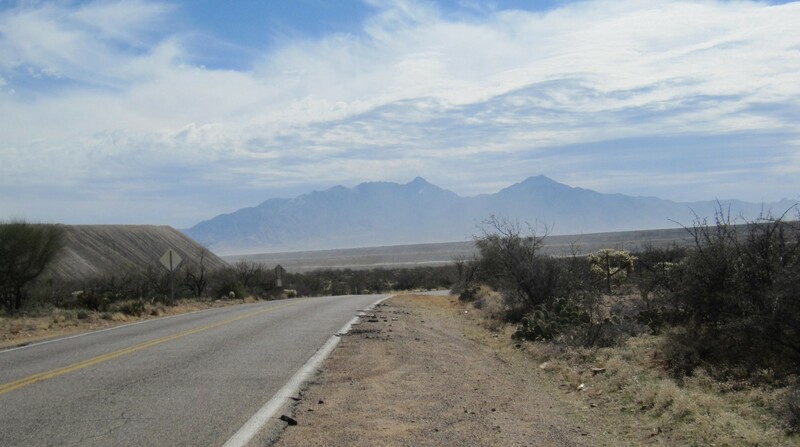 This entry was posted in Arizona, cycling, retirement, Uncategorized and tagged Arizona, cycling by Judy Crankshaw. Bookmark the permalink. Fascinating about the granite mine. But I really feel for the residents who have to breathe that dust. Yikes! Sure hope the blizzard warning was for home and not for where you are! BTW, your red truck with the white cap with the red and white T@DA is a beautiful match! Green Valley is surrounded by open pit mines – primarily copper. We look out our windows at tailings piles. The granite mine is just another little mine we happened to stumble across. 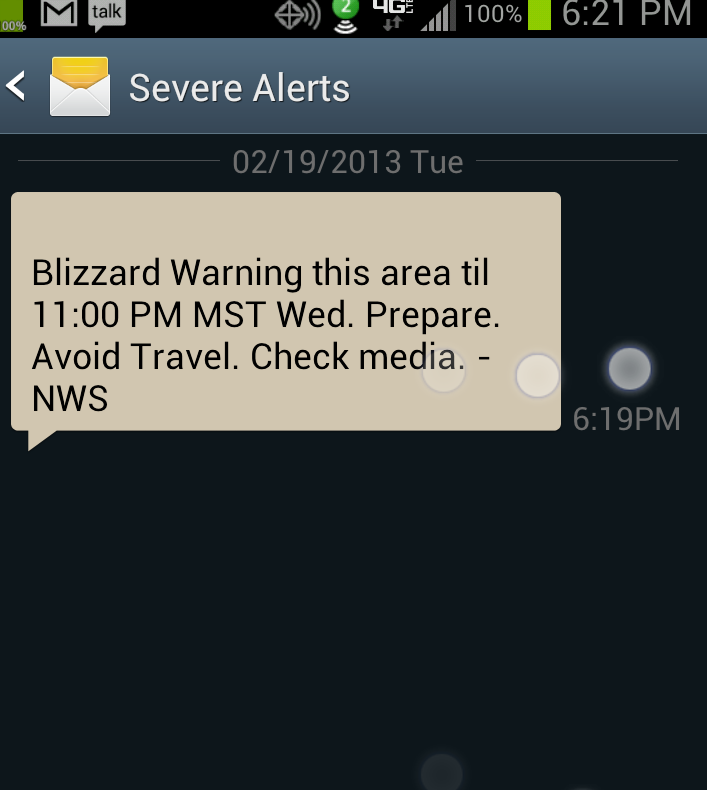 We STILL don’t know this morning if the winter storm warning is for AZ or not. Apparently a snowstorm closed the x-way between LA and Bakersfield last night, so it could well be here. Red truck was a happy accident. When we went looking for a new truck, this was the only 2012 left in town. We wanted a light top, since we spend time in the desert. The dealer was not happy with our choice – they like them all to be monocolored. We need a cap or cover for our pickup bed. I found a nice one available at budget prices, but it only comes in black. I’m afraid it would get so hot under there that some things might spontaneously combust… especially cleaning rags with solvent residue. Yours is a perfect choice for your purposes!